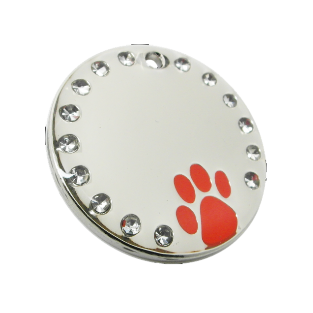 These diamante pet id name tags for dogs with Red Paw Print are extremely hard wearing and will last years. The tags are made from nickel plated steel and are highly polished.Each diamonte is inset into the steel and sealed in with a tough resin coating.This means the crystals will never fall out.The tags are 30mm in diameter and 2mm thick so they are a very strong tag indeed.Each tag has an enamel coloured paw print also sealed in under the clear resin coating. I will engrave up to 6 lines of 14 characters on back of these tags.